I have a '77 Marinoni with full Record/Super Record that I am cleaning up. I would like to restore it to as near vintage as possible. The handlebar tape currently on it is blue Cinnelli foam and doesn't appear to be original, mainly because it is so new looking compared to the rest of the bike. I ended up buying a couple rolls of Velox cloth tape, and then thought, "Hmmm... maybe this isn't right." I realize it's not THAT important, but it's kind of a fun game for me. Does anybody know the MOST likely tape that would have been used on this bike originally? Thanks! This is going to a tough one to find out which bar tape they used. Probably was Cinelli cork, some Pista Marinoni's used a half leather sleeve that covered the bar ends and extended about 1/2 way up the bar, and some used leather bar wrap all the way like the cork bar tape would be used. Never having owned a Marinoni and only rarely seen one I'm probably not the best person to answer this but you post need to be bumped. By the way, don't sell this bike, it is rare and your a lucky person for getting one. I don't recall cork tape was available that early, but Velox cloth tape certainly was. That said, I never saw a bike that expensive in the 70's. I never saw cork-tape in the 1970's. Velox Tressostar would be a safe guess for an original. It was the preferred tape. The tape scene, at least around Boston, was either cloth-tape - or the horrible polypropylene muck. Benotto Celo-Cinta Handlebar Tape....it's still availvable (NOS) you just need to look for it. I am lucky enough to own an orange 1976 Marinoni "Quebec"(just a name I gave it due to the fancy pantographing on the fork crowns) and I chose to use this tape on the bike. I have more sets of this handlebar tape which, though not actually vintage still looks pretty good and feels just fine on the bicycle. I have yellow, red, blue, black and cream color. I tuck this stuff away since I never know when another nice bicycle I find will need new tape. I'm thinking the Benotto Cello tape for that era. By then cloth was old and cork hadn't been invented. Cloth was old? heck my early 70's Puch came with cloth and I could buy replacement cloth tape for years afterwards and you can still find it today. Cinelli invented cork bar tape over 20 years ago, what year exactly I couldn't find, but highly doubtful that cork wasn't on the bike originally as I suggested earlier. I've been riding for over 40 years myself and I can't recall when I first saw cork, I just remember seeing it around for a long time so assumed it would have been out in the 70's. I know that for a while all you could find was plastic, cloth and leather, and even twine which I only remember seeing maybe 1 or 2 bars ever wrapped in twine. 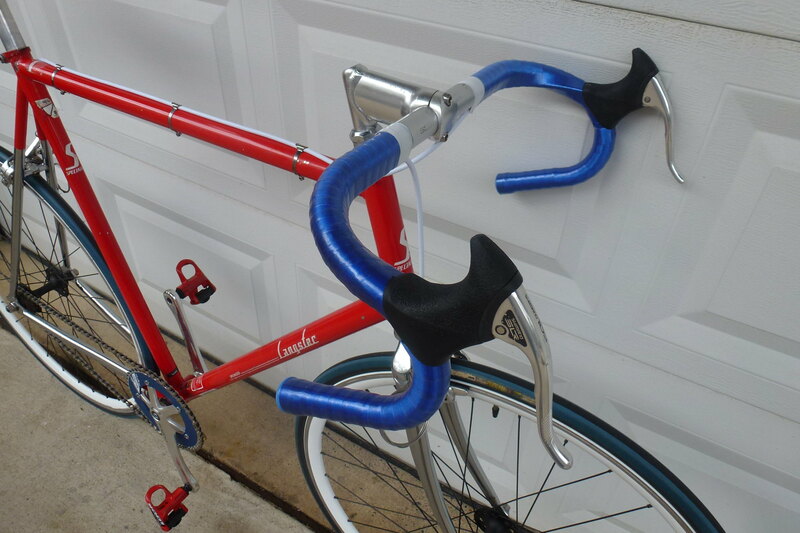 Cork handlebar tape was introduced in 1987, according to the Cinelli website. I'm thinking of what I saw in the late 70s early 80s and my recollection is that cloth tape was over. Sure they make it now and we think it's cool. But nothing is ever fashionable right after its era. The cool kids were all using the celo tape. The cork tape does go back over twenty years, but this is a thirty year old bike and I don't think the stuff existed when the OP's bike was built. I could be wrong, but that's my recollection of the era. At least I was having fun with the Benotto tape and would replace it almost monthly playing with different colors and patterns. I never understood the need to keep cloth or old tires on a vintage bike. Should I keep the tires or toss them out? Are there those who actually prefer the cracking old tires? The tape I personally prefer is the Arundel Gecko grip tape. It looks good and feels great. P.S. Not trying to knock going for the vintage feel, just want to understand the passion. Thanks. I keep the good, old stuff that works. And toss the old stuff that's worn out. I'm thinking of what I saw in the late 70s early 80s and my recollection is that cloth tape was over. . I know that my 84 Trek came new with cloth wrap; also thin and thick foam padding was available which I tried the thin and wrapped it with cloth around about 86. There's no need to go vintage unless you want to. The passion would be more for conversation during group rides; I ran into a guy about 5 years ago that had an old early 60's racing bike I can't remember the name of but it was in great shape, and he went so far as to ride with beechwood rims! The beechwood rims according to him was what came on the bike originally; and talk about a conversation piece, everyone on the ride was admiring the bike and those rims even though the rims were of recent genre. I know that with cars I'm keeping my 67 Ford Galaxy 500 Conv vintage original, and any parts I take off to improve certain dynamics like removing the points and replacing them with Pertronics electronic points, still maintains the stock look, it's an easy conversion back to original points, and I no longer have to adjust points ever again; the radio is stock but there's a hidden better stereo but sacrificed some sound since in 67 there was only one speaker in the center of the dash so I replace but kept the original speaker for one really nice speaker. For the Ford it's a passion to leave the car unmolested, whereas my 79 Camaro Z28 it's almost expected to be hotrodded so the engine is now a 580hp 350 instead of the stock anemic 170hp 350! I also have a cowl induction hood that didn't come with the car originally but I kept the original hood in case someone wanted the unmolested hood with the fake hood scoop when I sell the car, and it's stereo and speakers were severly upgraded, but I have the original 8track stereo again for the purist. All that to say, if a person wants to leave it vintage then by all means do so, it's actually more fun going vintage; but if you do modify it keep the original vintage parts so you can convert it back if you ever need to. This is balderdash. I built a bike in 1985, and cloth tape was still very much at large then. Sure, all the racerboys were using that hard, non-absorbent, unforgiving plastic tape by then, but I'm willing to bet Ronsonic $5 that it wasn't available in 1977 (show me a catalog). I had a 1981 Miyata 912 for a few weeks that had the Benotto tape on it; peeled it off, and what was beneath? Yellow Tressostar. The Japanese make the nicest cloth tape now, I hear. Last edited by Charles Wahl; 09-01-09 at 03:19 AM. I understand the desire to be absolutely period and model correct when building up an old road bicycle and I have tried to do so on a couple of occasions(1963 Peugeot PX10, 1971 Carlton Professional, 1975 CCM Tour du Canada). If I intend to look at a bicycle, rather than ride it, I will go original if possible but do so knowing that I will be negatively impacting "user friendliness". Uncushioned tape is uncomfortable for me since I have carpal tunnel syndrome in both hands and any padding is much appreciated on longer rides. And as for Old School pedals with clips and leather straps - forget it. I am not about to suffer a crash thanks to the older technology. Simply put, I install my clip in pedals on anything that I intend to ride on a regular basis. So, it is the old argument of form vs function. Do I want to look at it or ride it? For me, the answer is ride it and the cloth tape can sit on the shelf with my Rat Traps. But that is just me. I do respect the desire to go original and, even though I hate the pedals on my PX10, they will remain but I do not ride that wonderful old French bicycle often. i am restoring my 1975 masi GC. so if i am reading this correct, the velo-star cloth would be a "period correct tape" as well as the benetto ? Thanks in advance guys. Cloth and Cello tapes were the typical bar wrapping for that time. Vinyl padded and "cork" tapes did not become available till the 80's. Even one of the biggest bike manufacturers, Peugeot, did not switch over from Cello to padded vinyl tapes (at least, here in the US) til well into the 80's. Cotton tape was by far the most common tape for high end 10 speeds in the mid to late 70s. It's my understanding that various plastic tapes had been around since the 60s, and were popular at that time. I wasn't around so I can't say. Cello tape may have been around in Italy in 1975, but it did not catch on in a big way in the US until about 1981-1982, when it was all the rage. That's when I started racing jr's, and I recall clearly. Perhaps one of the forum members who raced in the 70s can fill in whether some hipster racers used it earlier. I didn't see it around. Though I was only a kid circa late 70s, I had joined the local velo club and saw what folks were using. Ambrosio Bike Ribbon became popular around around 1980 as well. It was, AFAIK, the first padded vinyl tape. Cinelli "cork" tape started to be used around 1984-1985. Not 70s appropriate at all. Also, some people were using the thin 'racing' Grab-On foam grips, which are conveniently forgotten nowadays. That's what my Masi had when I got it in 1980. I always used Velox cloth tape, still have some of the current Tressostar/Tressorex we have talked about in PMs. I remember that some of the Italian high end bikes I saw had the Benotto tape, in the very late 70s, and into the 80s and 90s. It looks neat, but I don't get along with plastic, slick bar wrap at all. The plastic still is too slippery for my taste, even though I wear cycling gloves, if I get sweaty the bars just aren't feeling right under my palms and fingers. My 1974 Raleigh International, new in 1979, had a white plastic of unknown provenance, it didn't make it off the show room floor. Changed it out for Velox Tressostar right there in the LBS myself. Up to you as to which you want to use, I'd have to go with SJX, Chombi and Salamandrine, pick between cloth and Benotto type, just be careful of some of the knock offs of Benotto. Probably Benotto of some sort, the cello maybe but they also had a padded or leather tape that was considered higher end if I remember correctly. I Hated that Benotto tape! It reminded me of plastic electricians tape and was slippery. I remember cello tape as being uncomfortable, I think it actually helped sales for foam bar covers like Grab-Ons, but most sport riders considered them too heavy, especially when they get wet.. Padded vinyl tape was a very welcome new product that fell between the two extremes. Matrix Clincher Rims - Bad Reputation?